How do I book my child onto their first class? If you are having trouble with our booking system. Please follow the video walkthrough on the link below to see a step-by-step video. I want to bring my son or daughter to the class; will it be suitable for them? Yes. The classes are suitable for all young people whatever experience of physical activity they have. For the technical sections of the session, the class is split into groups depending upon how long the students have been training with us for. This means the young people are always taking part in challenges appropriate to their level. We always start with a thorough warm up and end with a cool down, both are designed to improve mobility, strength and posture to help the young people practice safely. Wear clothes and shoes appropriate for sport (when it comes to footwear we recommend running shoes or similar) and bring a drink (water, juice or an isotonic drink would be good, we don’t recommend energy drinks for the classes). I have an existing injury; can I come to a class anyway? Consult your doctor for advice and speak to the coaches beforehand and we’ll advise you on which exercises you can still do and which to avoid whilst you recover. The weather is bad and / or it's cold, is the outdoor class still on? Am I too young to train Parkour? Though currently the youngest we accept in our classes is 7, we believe there is no lower limit to the age people can begin training. If you have a son or daughter interested in training and they aren’t 7 yet, get in touch and we’ll help you with some exercises and drills that they can use to begin their Parkour journey. Am I too old to train Parkour? Definitely not! Like the previous question we believe there is no upper age limit for Parkour practice. 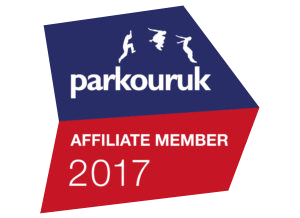 We’ve helped people well into their sixties train Parkour, it truly is a discipline for all. A bit of fitness will help but it is definitely not required, your fitness will improve as you continue to train, one of the many benefits of practising Parkour. Jumping between buildings, isn't that dangerous? Parkour is only dangerous when you practice outside of your current skill level or are not fully aware when you are moving. We don’t advocate attempting to jump between buildings for our students, there are many better challenges at ground level which will improve your training more. Injuries are actually quite rare in Parkour, though it looks dangerous from an outside eye, practitioners are actually very responsible in choosing which movements they try. Though there is the occasional scrape or bruise from a wall edge, it’s very unlikely for us to see a more serious injury. What is the difference between Parkour, Free Running and L'art du Deplacement? What could I do to improve my Parkour? Practicing drills you have learned at the classes outside will help as repetition is a big factor in effective Parkour practice. We also recommend working on your balance as it will improve your co-ordination and body control. Finding an area with lots of obstacles and creating routes to overcome them will expand your creative vision and improve your foot placement. What other training can help improve my Parkour? If you want to do supplementary training to improve your Parkour outside of the classes we would recommend some calisthenic (body weight) exercises for your upper body (for example; pull ups, push ups and dips), and weighted squats and sprints for your lower body (for squatting it is of great importance that you learn correct posture and don’t lift in excess of your capabilities). We would definitely advocate weight training, namely squats and Olympic lifting, if you want to undertake this training make sure you seek proper guidance to help you with correct form to prevent injury.